Here we are -- about a week into life. 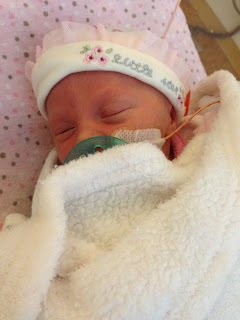 Julija and I just left the NICU and the two little ones. Man it's great being Dad! This week started off a little tough. Do you think it's possible to be full of joy and heart broken at the same time? I think there might be something like men’s postpartum syndrome or something, but I sure had it. Monday was my first day back to work since the long weekend and it felt like someone punched me in the stomach all day -- like my heart was broken from some loss. 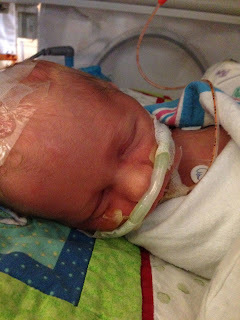 It was really an effort to stay engaged in the office and not day-dream of the twins back at the ICU. Thankfully whatever that was passed in 24 hrs and excitement has consumed me. 6:45 am pick up my Starbucks but don’t drink it. 7:00-7:30 play with Zella. Do whatever is needed including cleaning her face, taking her temperature, changing the diaper, holding her if I’m lucky, and moving sensors around. About the time I’m done she has also been fed and is mostly falling back to sleep. 7:30-8:00 play with Zander. He is 30 minutes behind schedule-wise so I run thru the same routine with him. 8:00-8:30 drive to the office and enjoy my Starbucks that is now perfect temperature. 9:30 Take the dogs out, read the mail and go to sleep. What you aren’t seeing is while I’m in the office or sleeping, Julija has been pumping at least 10 times a day (even at night) and arrives at the NICU around 9am. She does the same routine with the kids as I do, but thru a couple of cycles and usually gets home around 3 or 4pm. She also gets a lot more hands on during the day. At this point -- 6 days old, the kids are doing very well. Zella Izabella started sleeping in a crib last night and should have her IV taken off this afternoon. 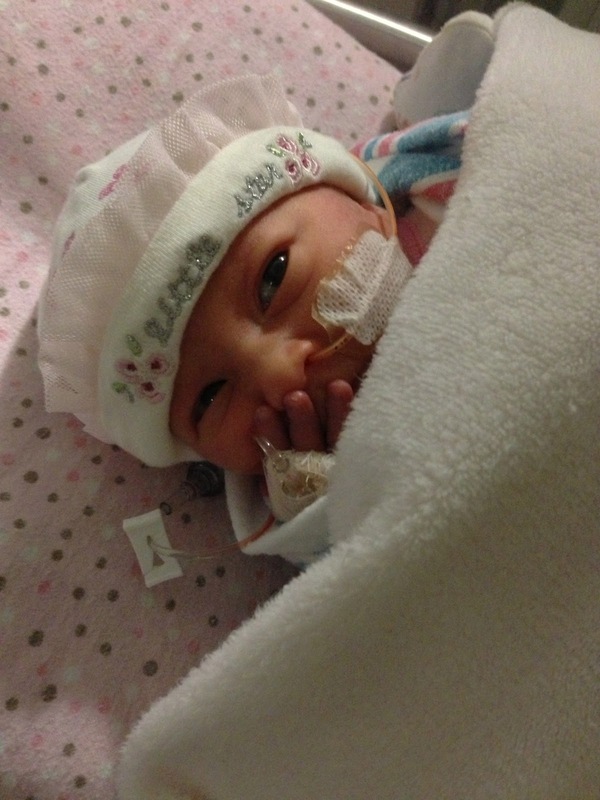 That will only leave her feeding tube (that she pulled out today) that should stay until she’s eating by bottle/breast full time. She is very reactive and absolutely knows the two of us by voice, scent and maybe even sight. 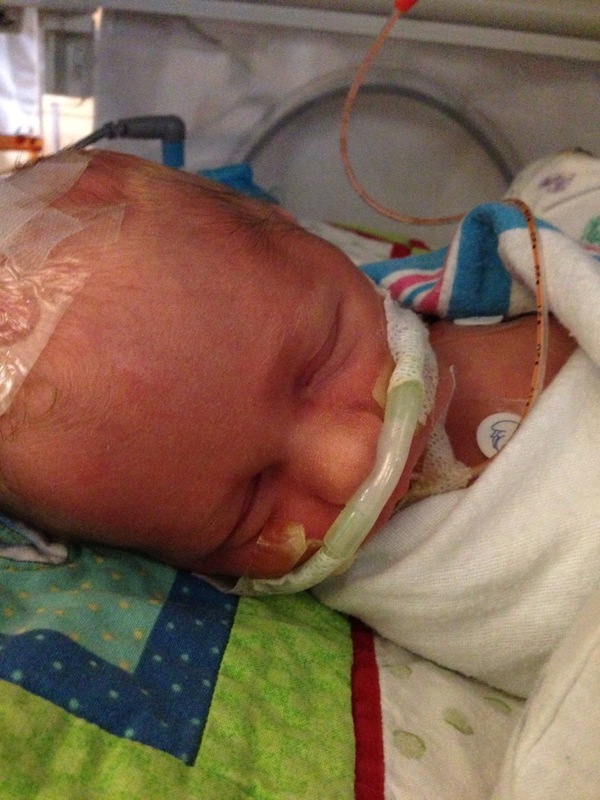 Zander Jackson is still in his incubator but the doc thinks he will be out in the next few days. 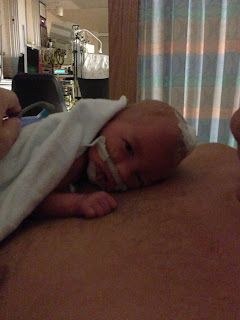 He’s also on a puffer (assisted breathing) with no extra O2 that should be off in the next day or so. He will also lose his IV this afternoon. All in all both kids are doing very well. I can’t say enough about the doctors and nurses in the NICU at SMH. They are top class... so much I can’t really imagine anyone more attentive to the kids. You can really tell how much they all love our kids (and all of them). UPDATE: Both kids got their IV taken out today. 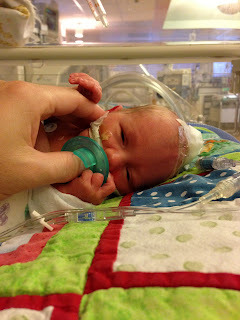 Zella did a little bottle feeding too... just to test the waters. Zander will go down on his breathing ZPAP tomorrow and should have it off in a few days. We got home and there was a voicemail from one of my life-long-best-friends: Richard Merchant "Merch". I love the guy and the first thing he says is "TWINS? You are the luckiest guy in the world!" Love him!